Let me start today with a small piece of Americana that many will not know. In 1869 workers digging a well in Cardiff, New York uncovered the petrified remains of a ten foot giant man. William Newell charged people 25 cents to see it and soon doubled that price. People poured in to see this discovery. While scientists had roundly called it a fake, theologians and preachers defended it as proof of the Biblical narrative in Genesis that said there were giants in the land. Eventually the financial interest in display was sold for $23,000, which today would be worth about $430,000. The man who purchased it was David Hannum. The group led by Hannum moved the giant to Syracuse and set up an exhibition. It drew so well that renowned showman, PT Barnum offered them $50,000 for the giant. After having his offer rejected, Barnum had a replica of the giant made and put it on display in New York claiming it was the real giant and the Cardiff Giant was fake. When asked by the press about the competing display in New York, Hannum replied, "There's a sucker born every minute." This famous American quote is often attributed to Barnum, when it was actually made about him. 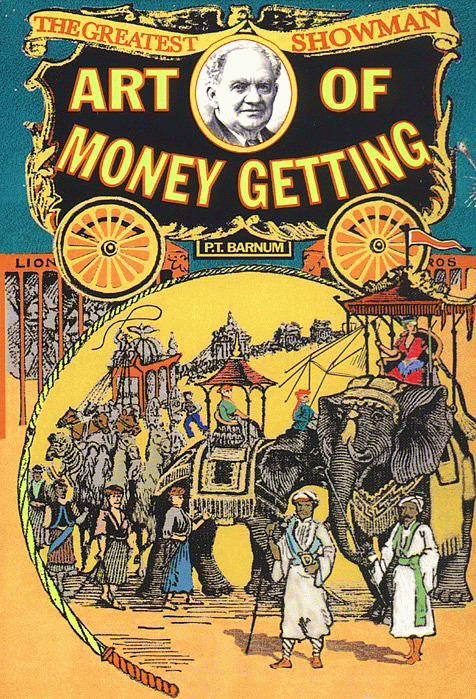 Barnum was sued by Hannum for calling his giant a fake and during the trial it was revealed that both giants were actually fake. The entire thing was a hoax set up by an atheist who had an argument at a Methodist revival meeting regarding the veracity of the Genesis account of giants being in the land. Both fakes are still on display to this day, albeit in much more humble exhibitions. I open with this because it is open season for suckers again. Once again, for Christian suckers. Just as they wanted so desperately to believe that this hoax was real in 1869, they still want to believe hoaxes perpetrated against them today. In 2012, the hoax was that Mitt Romney was a Christian, when in fact he was a Mormon. Christian political operatives huddled around Romney and offered him up to the Evangelical voting bloc as the choice of God. As if God would choose a man who belongs to a satanic cult that is polytheistic in nature and believes Jesus and Satan are brothers. As if God would choose a man who believes in a religion that has added two more books to the cannon of Scripture and considers them before the Bible. Joseph Smith, who founded Mormonism, claims an angel gave him golden tablets that contained the new gospel, which would become the Book of Mormon and the Pearl of Great Price. According to the Bible, let him be accursed. But according to the great Cardiff Giant Hoax, there's a sucker born every minute. Even Billy Graham Ministries removed Mormonism from its list of cults leading up to the election. And it worked as a whopping 78% of Evangelicals came out to vote for a man based on the false authenticity they were sold but who did not actually share their faith or beliefs. Fast forward to today and we see the same thing taking shape with Donald Trump. Paula White -- worth in excess of five million dollars and on her third marriage, Paula White is the poster child for huckster prosperity preachers who have no shame. I have written before when she claimed God told her to tell her viewers to send her $229 because of 1Chronicles 22:9. Just this year she mangled Pentecost to try and fleece her flock for more money. She is a wolf of the highest order making merchandise of the sheep of the Lord. Robert Morris -- is one of the worst tithing abusers in the world. Routinely beats his sheep by butchering Malachi and nearly every Bible verse he comes across to try and bleed more and more money from his congregation. He is the proponent of the teaching that if you do not give him the first ten percent of each check, God will curse all of your money. Woe to he who lies on behalf of God to abuse the very sheep of the Lord. A.R. Bernard -- disgraced mega church pastor from Brooklyn was recently exposed as a fraud with the conviction of Pastor Kong Hee. Pastor Hee was convicted for stealing 50 million dollars from his Singapore church to finance the secular music career of his wife. Half the money was used to try and create the career and the other half was used to try and cover it up. Who was the Chairman of the Advisory Committee for Kong Hee? A.R. Bernard. Upon conviction and the eight year sentence to prison, Barnard doubled down by still back the criminal, Hee. Kenneth Copeland -- Pastor Copeland makes Paula White blush. He is worth over 760 million dollars and by far is the richest televangelist in this country. He owns a Learjet worth 17 million and a six million dollar mansion that he has the temerity to write off as a "parsonage." There is not a bible verse that is safe from the absolute evisceration Copeland traffics in to steal money from people. The HBO Comedy show "Last Week Tonight" recently did an expose on televangelists who make their killing off of helpless victims. The Copeland portion dealt with a woman dying of cancer who refused medical treatment because Copeland had taught her that she just needed faith. She kept upping her donations to Copeland right up until the moment she died. Ronnie Floyd -- the most recent Head of the Southern Baptist Convention, Floyd is a notorious ecumenist that has endorsed false teachers across this country from Copeland to Mike Bickle and IHOP. He is also a fierce believer in the Morris "cursed money" false theology described above and has led the SBC off the doctrinal cliff since taking over. These are just five names beloved. There are other false teachers on this panel such as Jentzen Franklin and David Jeremiah, as well as Christo-political operatives such as Jerry Falwell Jr. and the aforementioned Dobson. Now do not get me wrong. Considering that these people routinely treat salvation in such a slipshod and cavalier manner it is possible that one of them convinced Trump to say a nine word faux-prayer that allows them to believe they are not lying in the wickedly deceptive hearts. The truly sad thing is the majority of Christians will look at this advisory board as a positive development for our faith. This is an advisory panel of some of the most egregious wolves in the church today slaughtering God's sheep every single week. It should not be celebrated by Christians. Beloved, the problem is I know what this looks like. I know what this smells like. It looks awfully familiar to 2012 when Christians were told the Mormon was God's choice. It smells an awful lot like 2008 when we were told that the guy on his second marriage, who was part of the Savings and Loan crooks was the moral choice. Heck I remember when we were told to rejoice that George W. Bush thought Jesus Christ was his favorite philosopher. In 2000 and 2004 we were assured of the faith of Bush. Stories were widely publicized about Billy Graham himself leading Bush to Christ, even though Graham was quoted as saying he recalled no such thing. As Bush was preparing to leave at the end of his second term he admitted in an interview that he believes all religions serve the same God. So if it looks like a giant petrified man and smells like a giant petrified man I am going to guess it is a hoax. I will not be caught swearing to the veracity of what is false while the rest of the sane world sees the man behind the curtain. After 20 years of being promised nonsense packaged by political operatives disguised as Christians and sold by wolves disguised as pastors, I am going to play the part of David Hannum this time. There is a sucker born every minute. Don't let it be you.